Last week’s riding lesson was amazing. I’m so glad I grew some patience (seriously a big accomplishment for me) and am taking the time to do this right. Horses are way more work than I thought, but I’m absolutely loving every minute of it. I’m also learning a lot about what I like and dislike in a horse. This time around I was honored to ride Indy, a beautiful 14.2 hand Quarter Horse. I am really leaning towards the Quarter Horse for my own horse, especially one that’s a little bit smaller. I’ve always thought I wanted a really big horse, but have found the less barrel-chested ones to be more comfortable for my long model legs (for those of you who don’t know me, I’m 5’2″ if I’m standing really tall… clearly I’m not all legs). I did some arena work this time, which was very different from riding on the trail. The focus was working on my gait changes and getting me comfortable with my position on the horse. Muscle memory, if you will. Miss Indy is a bit of a prima donna and definitely tested me throughout the ride. I was having the time of my life trying to anticipate when she would take the moment to try to slow down or, most of the time, speed up – that girl loves to run! It was a great lesson! 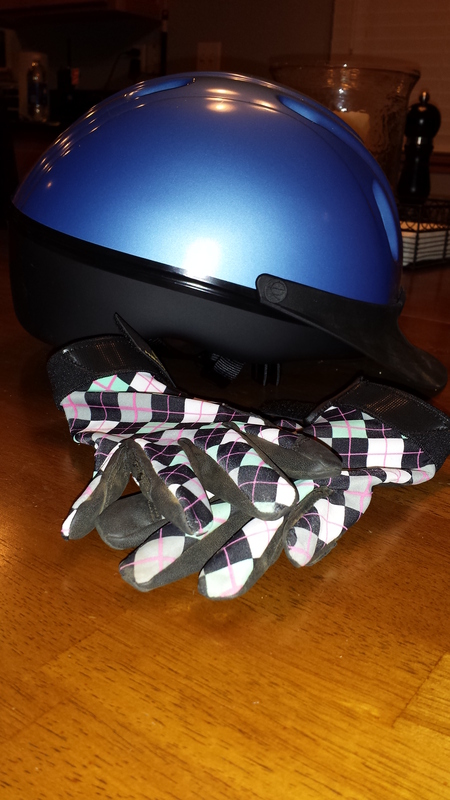 I also wore my new gear – the gloves Mike gave me for Christmas and the helmet that Kati & Nate bought me. 🙂 Safety first!